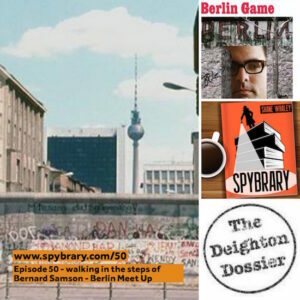 Rob Mallows from the Deighton Dossier website joined us on Episode 1 of the Spybrary Spy Podcast. Here are the answers to his quick fire questions. Episode 1 - Rob Mallows Favourite Spy Novel? Berlin Game Favourite Spy movie? Deutschland 83 Favourite Spy? Bernard Sampson Favourite 007 movie? Casino Royale (2006) Favourite 007 actor? Daniel … [Read more...] about Rob Mallows from the Deighton Dossier!